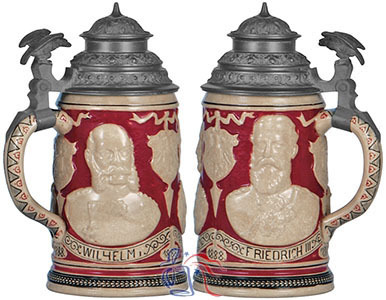 Stein depicts Wilhelm I (1797-1888), Friedrich III (1831-1888) and Wilhelm II (1859-1941), the three emperors who reigned over the German empire Germany from 1871 through the end of World War I. 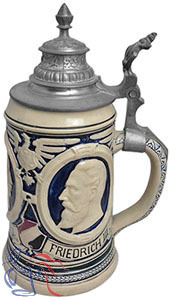 Dated “1888” in the mold, it commemorates the passing of Wilhelm I, as well as the ascension to the throne of both Friedrich III and Wilhelm II. Following the death of Wilhelm I in March of 1888, Friedrich III was crowned Emperor, but reigned for only ninety-nine days due to cancer of the larynx. He was succeeded that same year by his son, Wilhelm II. The images at the right and below left show this model number as it is depicted in early manufacturer catalogs. However, note that a second version (below right) also exists showing the same three emperors in the same relative positions, but in profile rather than portrait-style views, along with a variety of other design alterations. The reason for and timing of the second version are currently unknown. See also Nos. 489 and 558.